Line a baking pan (8x8 is fine) with foil. Slice tomatoes in half and place on prepared pan. Drizzle with oil and add salt and pepper. I stir the whole thing around with my hands. Bake for 1½ to 2 hours until slightly shriveled and browned in some places. Remove from oven while you make sauce and pasta. Heat a small saucepan over medium heat. Add butter to melt and cream. 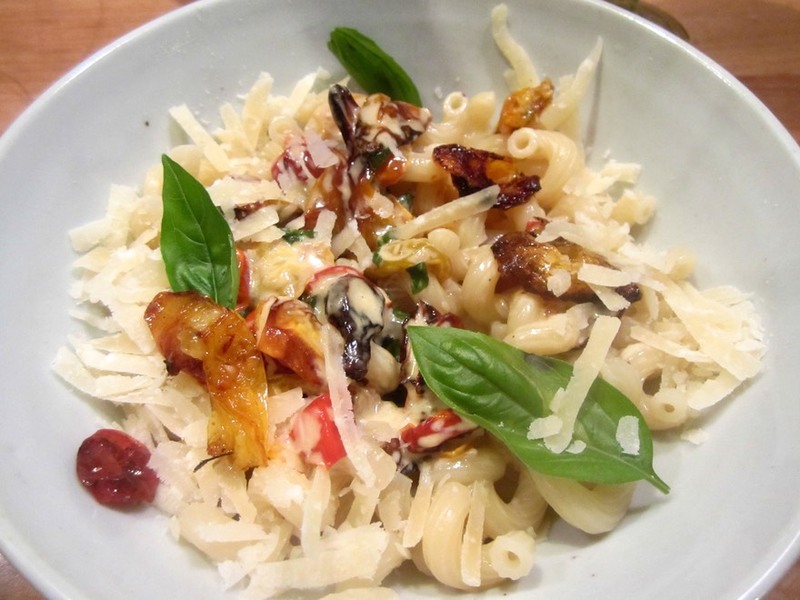 Stir in red pepper flakes, ½ cup Parmesan cheese, basil, and Vermouth. Add in tomatoes and all accumulated juices. Serve with favorite pasta and extra Parmesan on top. Put tomatoes and cheese on a plate, drizzle with a few tablespoons of oil and dust with salt and pepper. Add herbs. Serve at room temperature with toothpicks.